Back in Guestbook entry #1452 Dan Daly replied to my message regarding McGovern's Bar and then Quint replied further down saying "Now that's a hell of a name for a former Marine to have." The three of us are former Marines and I'm sure that the rest of you have no idea what that means, unless you are former Marines. Private Daniel Joseph Daly is one of the most famous Marines of all times. On May 29, 1900, he landed along with other Marines in the Harbor of Taku, China during the Boxer Rebellion. One night he single-handedly held off hoards of attacking "Boxers" and in the morning "The gray light of dawn revealed heaps of Chinese corpses on the wall of Peking near his bastion. Using the dead bodies as a shield, Daly crawled back along the wall to his own troops as dawn broke bright and clear." Because of his single handed action he was awarded the Congressional Medal Of Honor. 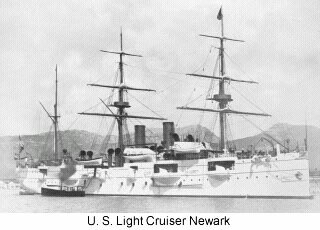 Now here is something that I bet the other Marines on this site didn't know - He and the other Marines landed while serving on the U. S. Light Cruiser "NEWARK." How is that for a little-known bit of Newark history.